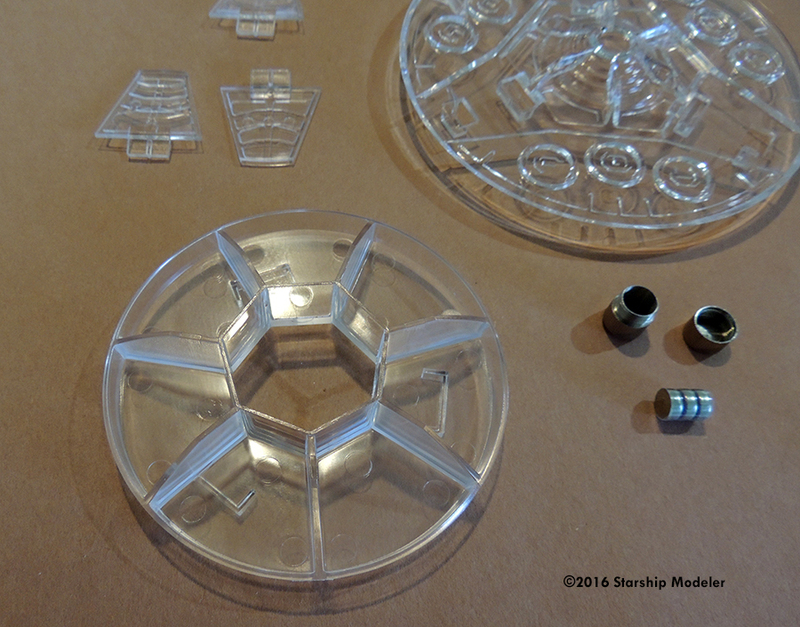 Parts: 6 injection-molded styrene, plus Lighting module. 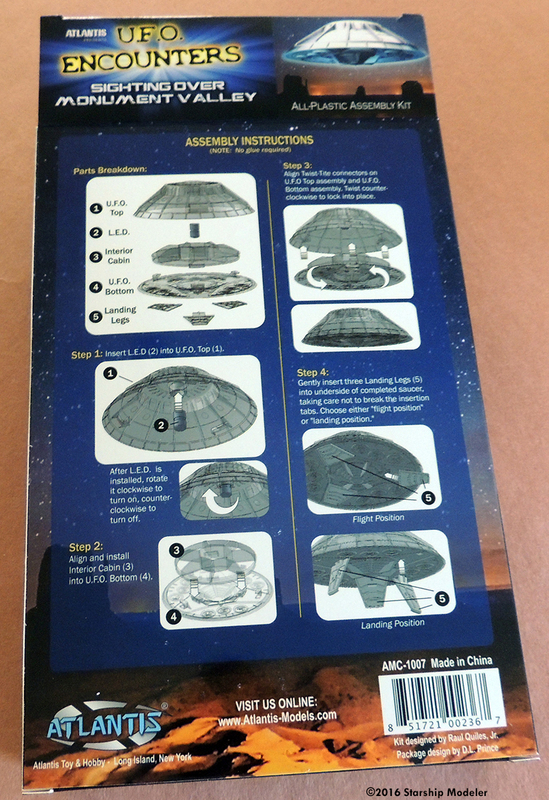 Instructions: Assembly guide on the back of the box. Molding Quality: 10 - no flaws. Detail: 7 - acceptable for the subject. Overall Rating: 9 - a fun, well-produced kit. 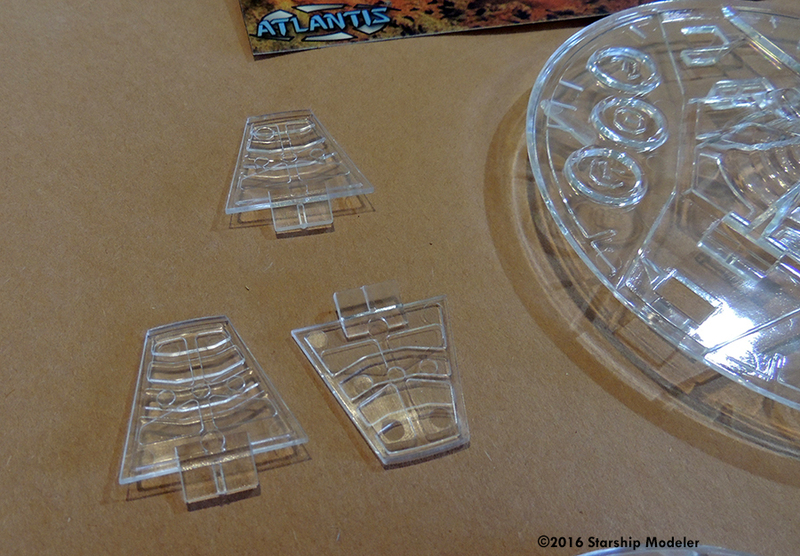 Atlantis Models have been releasing a number of different UFO kits over the past few years. 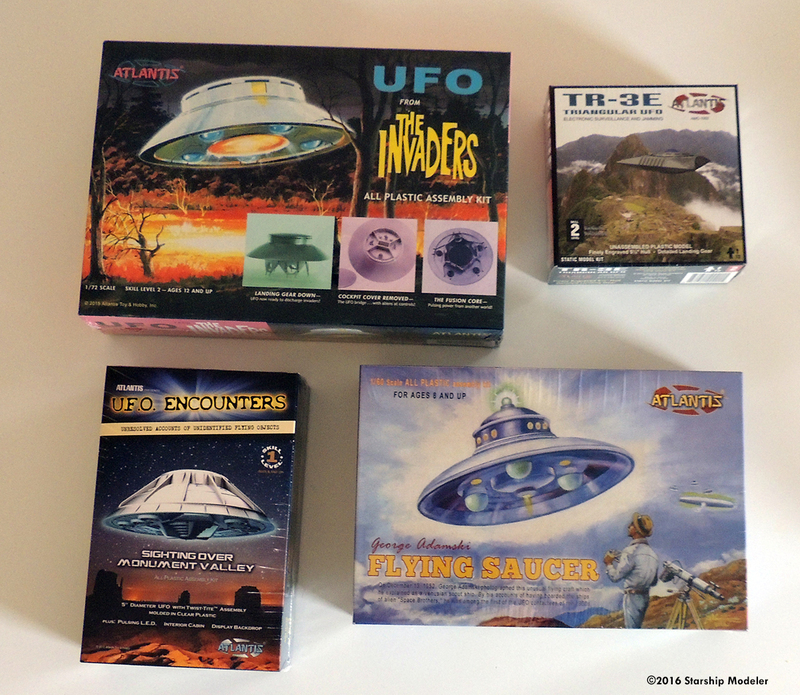 Their second release in their 5" Saucer series is this UFO Encounters: Sighting Over Monument Valley kit. (Apparently, Arizona's Monument Valley has been a favorite hangout spot for UFOs). The model doesn't represent any particular craft from a documented sighting. It's a decent-sized model, 5" (127mm) in diameter and 2" (51mm) tall when built in "flight" mode (extend the "landing legs and you gain another inch (25mm)). The kit is comprised of six pieces in rather sturdy, and crystal clear, injection-molded styrene, plus a two-piece LED mount, 3 LR41 "button" batteries, a printed backdrop on cardstock, and the plastic "pizza box stand" that comes with almost every Atlantis UFO. 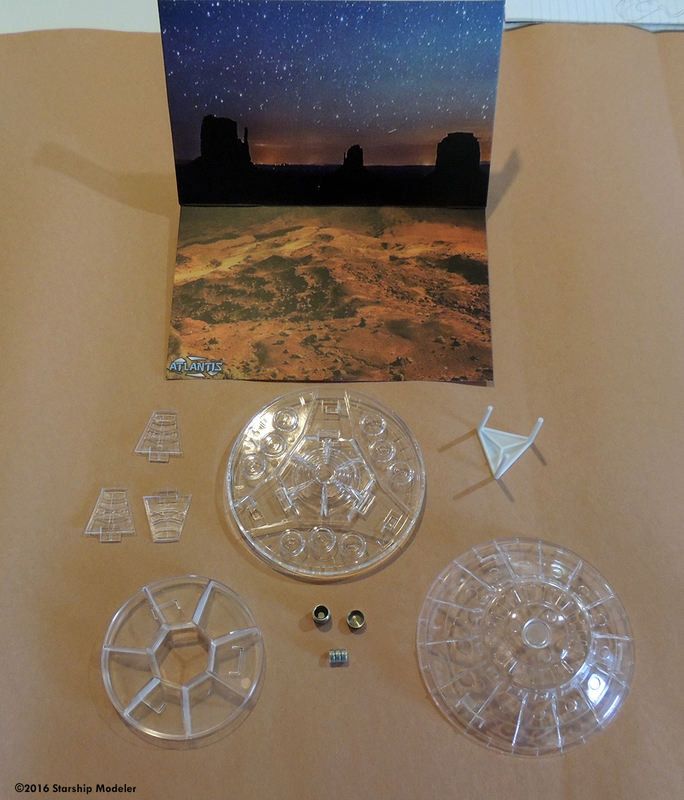 Also available is a version of this kit molded in glow-in-the-dark plastic. 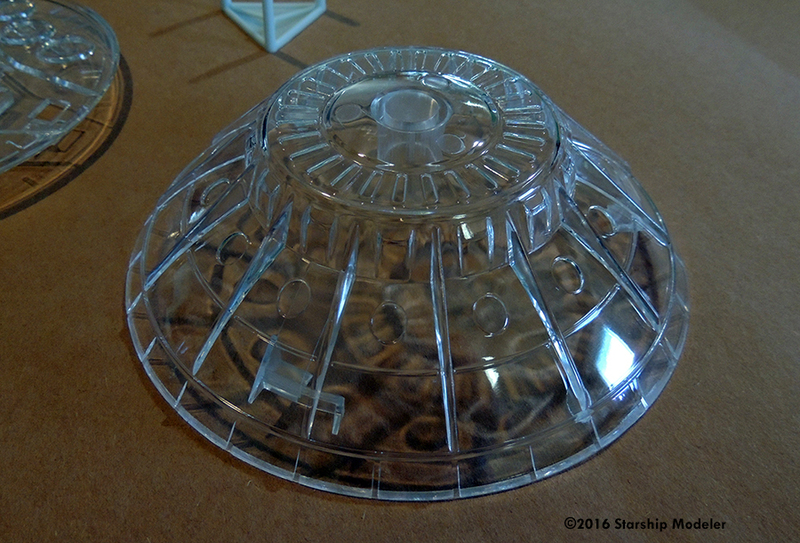 The plastic parts comprise hull top, hull bottom, a bare-bones interior reminiscent of the one in the Invaders UFO kit, and three landing legs that may be posed up (flush against the bottom hull) or extended. Everything either snaps or twists tightly into place - no glue is needed. Detail, while kind of heavy, is crisply rendered, and includes raised alien glyphs on the underside of the hull. The lighting module consists of a metal housing that contains the batteries and two tiny - but very bright - LEDs. To turn it on, you screw the two halves together all the way, so that the batteries inside touch the LED housing (to turn it off, you just untwist it a quarter turn or so). The green and blue LEDs flash in a random, staccato pattern. I need to fiddle a bit with my particular module to get the batteries to contact properly and get the lights going, but that's just a matter of tapping it on the desk or shaking it a little. I did need to remove the plastic sleeve that keeps the batteries together to get it to work. Assembly is pretty straightforward. There are no parts trees, ejector towers or other things to clean up. You just snap the interior to the bottom hull piece, put the lighting module in its place at the top of the inside of the main hull, and twist the top and bottom hull halves together. Fit is really pretty good, and the seam between the two parts isn't noticeable. The halves untwist easily so you can get at the light module. There's no detail in the interior, other than "floor" and "walls", but you could easily fill the spaces with equipment, seating, dance floor - whatever you can imagine. Whether or not you detail it, the interior piece does seem to be necessary to keep the model together. 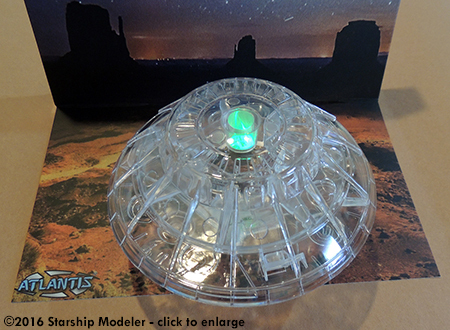 Since the model doesn't represent any particular UFO, you can paint and detail it any way you like. (Well, you could do that anyway, but no one can tell you that you are wrong in this case). 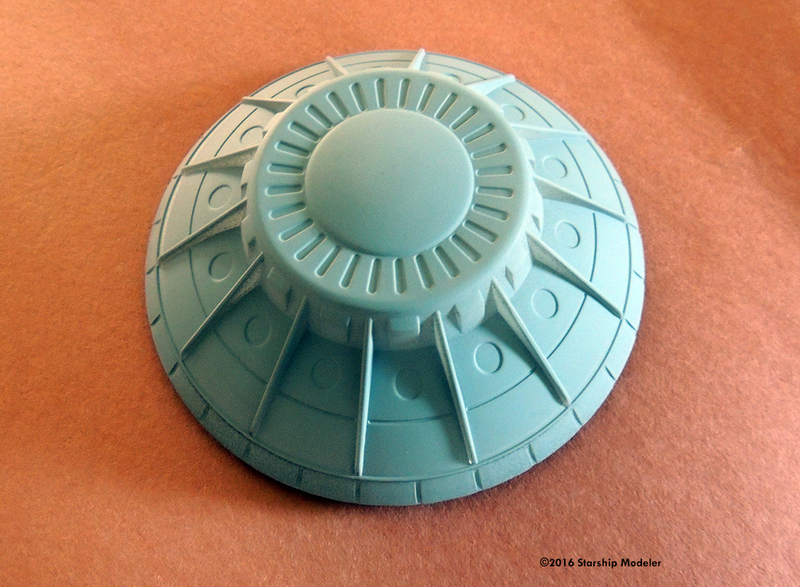 There is a ring of oval insets around the outer hull. Mask these off - it should not be too difficult - and they'll be windows. With a little more work, you could mask off around the glyphs on the bottom, or the ring of inset detail on the top, and let that LED light shine through. ^ Interior and lighting module pieces. Image: Instructions are on the back of the box. I think Atlantis has a winner here. The lighting module alone is worth the price of the kit. Fit is good, the model is a decent size and well-enough detailed for the subject. It should be a fun one to paint. 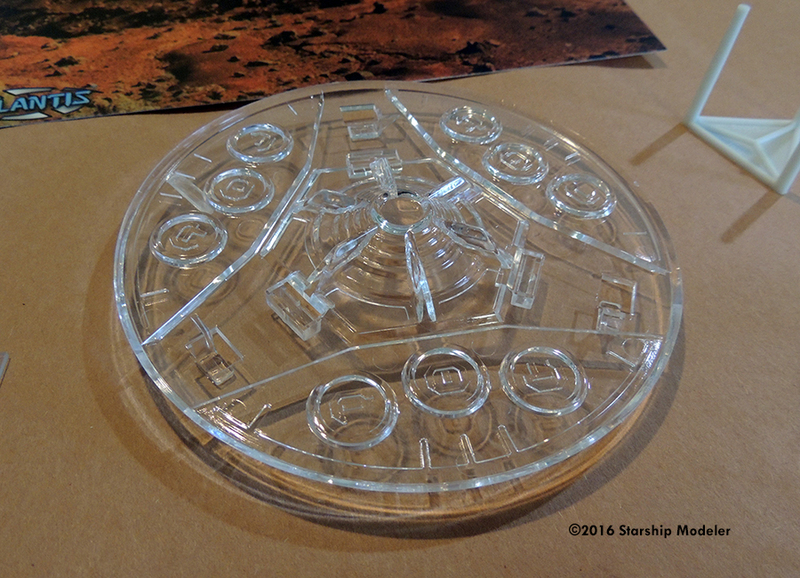 This page copyright © 2016 Starship Modeler. First posted on 30 April 2016.